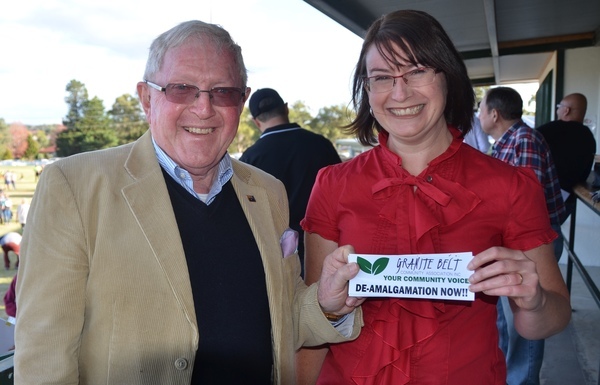 Rev Alan Colyer and Amanda Harrold of the Granite Belt Communuity Association. The Granite Belt Community Association (GBCA) will hold a public forum this Tuesday 11 December to update locals on progress with its campaign for the de-amalgamation of the Stanthorpe region from Warwick. The forum will be held at the Stanthorpe Showgrounds from 7pm. GBCA president Rev Alan Colyer said the forum would provide an update on the business plan and feasibility study for de-amalgamation to be presented to the Queensland Government, which the group expects to finalise by the end of 2018, and “next steps”. The government has said that if the business case stacks up – and de-amalgamation will not financially disadvantage the Stanthorpe community – the matter will be put to a region-wide vote. In other words, all residents of the current Southern Downs Regional Council area would get to say “yes” or “no” to a return to separate Warwick and Stanthorpe/Granite Belt councils. As of last week the GBCA had raised more than $60,600 from 212 individuals and groups to fund its de-amalgamation campaign.